So for some reason I have decided it’s time to hack up Nerf guns. I was inspired to start by this neat little project, which added an ultrasonic rangefinder to a Nerf Recon MKII. The world is full of simple digital shot counters for Nerf blasters but I liked the retro-futuristic design of the Pimoroni Rainbow Hat and the colored LEDs for ammo. The original product used a proximity sensor to detect a shot being fired, and a button on the hat to signal a reload or increment ammunition capacity in the magazine, though, and I figured I could find another way. As awesome as the zip-ties-and-perfboard aesthetic of the original product was – very Metro 2033 – I wanted to enclose the electronics, package the project up, and improve the interface a bit. I also wanted to use a quicker-firing Nerf model, and settled on the Stryfe as it’s basically everyone’s favorite flywheel gun. 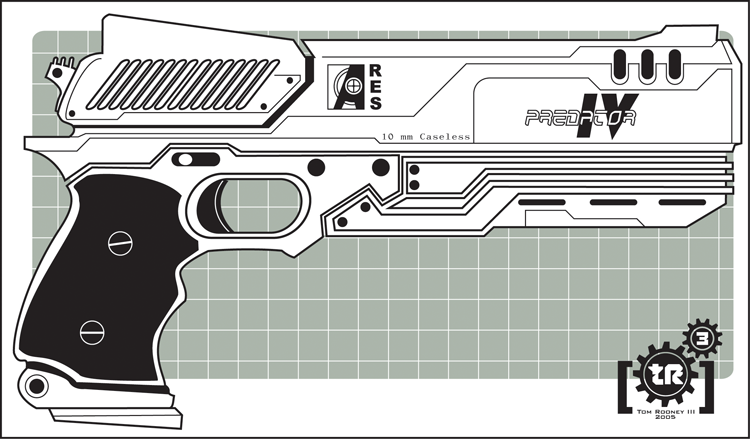 I was a giant Shadowrun fan growing up, and so a big, bulky, smart semi-auto pistol always makes me think of the Ares Predator, so: Project Predator was born. Make the finished product look awesome. This sounds awesome! I’m glad I inspired someone, very excited to see it in action!